Our hearts beat. We inhale and our lungs expand, sending life-giving oxygen to our red blood cells. Our kidneys do their jobs as sophisticated trash collectors, processing about 190-litres of blood per day to sift waste products and extra water from our systems. Our bodily organs work in unison, all day long, day after day after day. And most of us never even think about them. We take our body organs for granted. They are just there. Forty-six-year-old Bobby Bates is different. 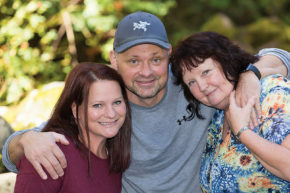 The Comox Valley father of two genuinely appreciates his one fully functioning kidney. For him, kidneys are a big deal. He is reminded on a daily basis to be ever thankful that the gift of a kidney saved his life—a gift from his sister, Penny Bates. 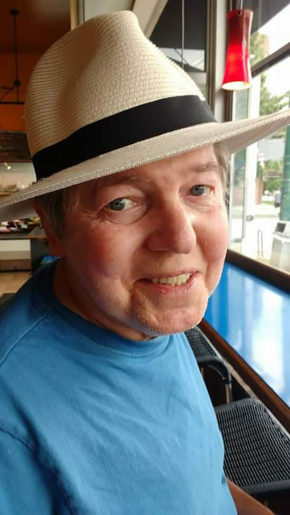 Bobby called his mother, Linda Dobinson, and invited her out for coffee, hoping to “break it to her gently” that his health was rapidly failing. So began the long processes of undergoing countless medical tests, travelling to Victoria and Vancouver, and hoping beyond hope that a transplant would be possible. Linda, other family members, and several friends who had also come forward to be tested were all ruled out as donors rather quickly. Thankfully, Penny was a perfect match. Although the two siblings were born 11 months apart, their genetic make-up is so similar it is almost as if they are identical twins. It was like a match made in heaven. That day came on November 19, 2014. Bobby, his wife Marla, daughters Olivia and Teryn (then ages 15 and 17 respectively), and Linda went along for moral support. Linda agrees. “There is a feeling of overwhelming helplessness, seeing both of your kids go in for surgery. Their guardian angels and yours are on duty. You can’t afford to have doubts. My heart was simultaneously breaking and bursting with pride,” she says. Mercifully, Penny’s fears of organ rejection were unfounded. Both she and Bobby recovered relatively quickly and they are back to leading active and normal lives. He is ever grateful for this most precious gift. While someone can ‘gift’ another person a kidney, for obvious reasons a living donor can’t give away their pancreas, heart or lungs. Being on the Provincial waiting list for organ harvesting from a deceased donor presents different challenges. Tony Duke understands what Bobby went through because six months ago he was also desperately hoping for a guardian angel to help him. The 61-year-old Union Bay resident was severely debilitated from a lung disease associated with his rheumatoid arthritis. Doctors had advised him that he needed a double lung transplant. For him to live, someone else would have to die. And the statistics were not encouraging. According to BC Transplant, less than one per cent of British Columbians die in a way that enables them to become organ donors. Despite the fact that there were 422 organ transplants performed in the province in 2015, 21 British Columbians died while waiting for transplants. Of last year’s organ donations, 95 were from deceased donors—from which multiple organs can be harvested—and 113 were from living donors. As of January 1, 2016, there were still 562 British Columbia residents on the transplant waiting list. Tony was one of them. According to his wife, Beth Campbell Duke, Tony had become depressed and reclusive. Fully dependent on supplemental oxygen, connected to an eight-metre long oxygen hose 24/7, he had lost the stamina for and interest in his antique appraisal business. He essentially became housebound, avoiding contact with family and friends. 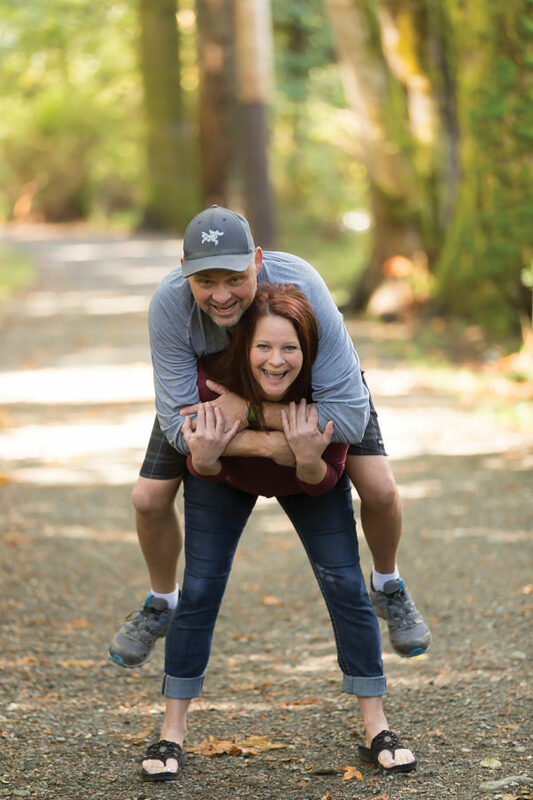 “At first, the thought of a transplant was upsetting for both of us,” says Beth, speaking on Tony’s behalf because he is in recovery from a double lung transplant and still has bad days. “We spoke with other people who have had transplants and to our transplant team. They reminded us that people are dying all the time. It is the awareness of the cycle of life. We were in a position where we didn’t have the privilege of ignoring it. The reality of this hit Tony particularly hard because his brother, Peter, also had lung disease and had died a few years ago. Peter had not been a candidate for a transplant. Tony questioned, ‘Why am I on the list for a lung transplant and my brother had to die?’ So, there is a bit of survivor’s guilt there. Beth explains despite the excitement of getting ‘the call’ there is no guarantee of getting the transplant. The organ donor is in the hospital on ‘organ support’ (not ‘life support’), so there is a window of time to call potential recipients. Organs are usually harvested in the evening because the operating theatres are booked during the day. Sometimes the surgical team will prepare more than one patient, just in case. If at any point they find a problem with any of the donor organs or potential recipients, they cancel the transplants. Tony was admitted to hospital later that afternoon. They did the necessary pre-operative tests and determined that it was a good match biologically and the lungs were a good physical fit. He went into surgery at 3:00 am on May 4. Beth’s eyes tear up with a mixture of joy and sadness when she recalls Tony’s reaction to the news. “May the fourth be with me!” he said with a weak smile as they wheeled him into the OR. Tony would spend the next three months recovering in Vancouver. There were some complications, and there will always be challenges, but he is now free of his dependence on supplemental oxygen and making huge strides toward living a normal life. He knows that his organ donor was an individual who died of a drug overdose. He and Beth think about this person often. While Bobby Bates and his family chose to live through their organ transplant experience more privately, the Dukes felt that they needed to share their story. “This became apparent to us early on in our journey, when we began sharing on social media and doing internet research that connected us with several online support forums in various countries,” says Beth. “It is not commonplace for people to see details about organ donations and transplants. But we feel that this is a subject that needs to be discussed. The three-month waiting period for us was relatively short, yet it seemed like forever because we had no control. When you are on the waiting list you are just sitting there, waiting for the phone to ring. Your lives are on hold. A decal on your driver’s licence or Care Card is no longer enough to ensure your wishes to be an organ donor are carried out. It only takes two minutes to register your decision on organ donation online. And age doesn’t matter—the oldest recorded organ donor was 93. Register at www.transplant.bc.ca.